Immediately, a shock to my balloon made itself felt, so abrupt and rapid that I thought it was cleaving the air, and I opened my bewildered eyes wide while gripping my gondola with both hands for fear of falling. Dragged by the Lunian's, my aerostat went through the ultimate layer of the Earth's atmosphere with a kind of violence-but scarcely had it broken through the Moon's centrifugal force to fall into its sphere of centripetal attraction than I felt myself rising toward our satellite. The Adventures Of A Parisian Aeronaut In The Unknown Worlds (1856) by Alfred Driou is a social satire in which our satellite is reached via hot air balloon. It stands out as a markedly anomalous literary item of its times, not merely for its imaginative extravagance, but also for its keen interest in technological progress. Predating Jules Verne, whose Five Weeks in a Balloon was published in 1863, Driou might be reckoned a pioneer in the popularization of science in France. 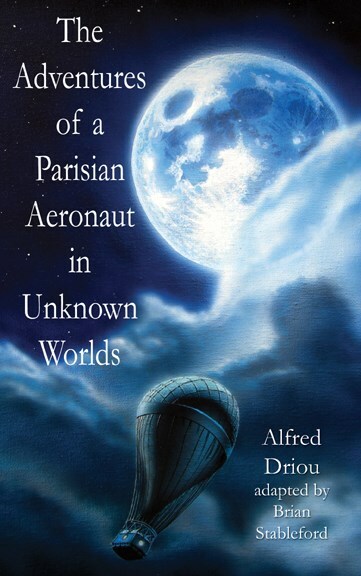 "The Adventures Of A Parisian Aeronaut is just as anomalous in the history of imaginative fiction as it is in the context of Driou's literary career; there is nothing else like it. That is partly to do with its awkward hybrid status, uneasily suspended between religious fantasy and travelogue, and between wild imagination and vulgar popularization." Brian Stableford.